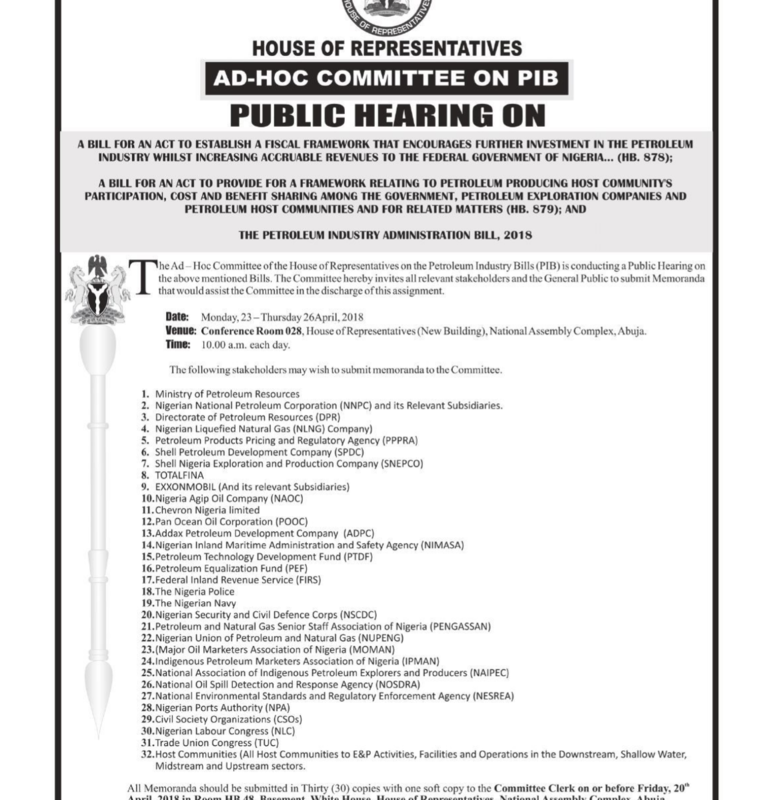 The House of Representatives has announced that public hearings are to take place on the 23rd – 26th of April, 2018 on the Petroleum Industry Fiscal Bill, the Petroleum Host Community Bill and the Petroleum Industry Administration Bill. These three bills as well as the Petroleum Industry Governance Bill, which was passed by the National Assembly and is awaiting presidential assent, constitute the full reform package being proposed by the National Assembly in the reforms of Nigeria’s petroleum industry.The Petroleum Industry Fiscal Bill proposes the new fiscal package for the oil and gas industry and addresses the proposed royalty regime and new tax arrangements. The Bill also provides incentives for processing of petroleum, including gas processing and crude oil refineries, which is a central plank of the vision of this government articulated in its petroleum policy. The Petroleum Host Community Bill provides for arrangements that enable host communities in the upstream, midstream and downstream sectors benefit directly from the operations taking place within their communities. Finally, the Petroleum Industry Administration Bill addresses the new licensing and regulatory arrangements across the value chain in the oil and gas sector. Petroleumindustrybill.com will attend the public hearings and keep you up to date on the developments.